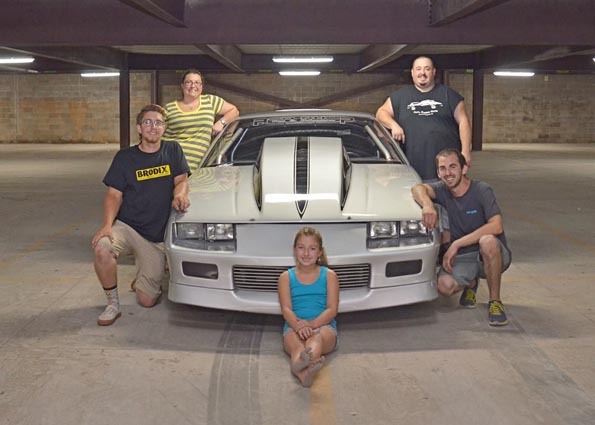 Derek’s larger than life character is one of the most popular figures on Discovery Channel’s Street Outlaws. 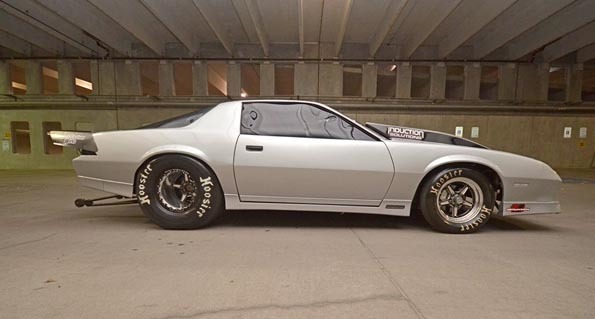 His car is an instantly recognizable third generation, wide tired ’86 Camaro aka the Silver Unit. 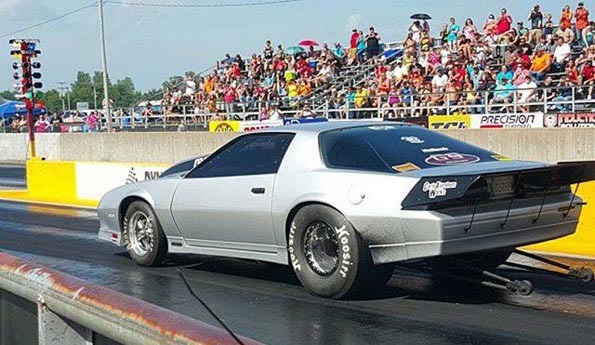 Silver Unit’s 605ci, naturally aspirated Chevy motor was a perfect candidate for a full-house Haltech system complete with an Elite 2500, PowerSelect CDI, TCAs, I/O Expander, Wideband Controller, IQ3 Dash and SmartWire module. 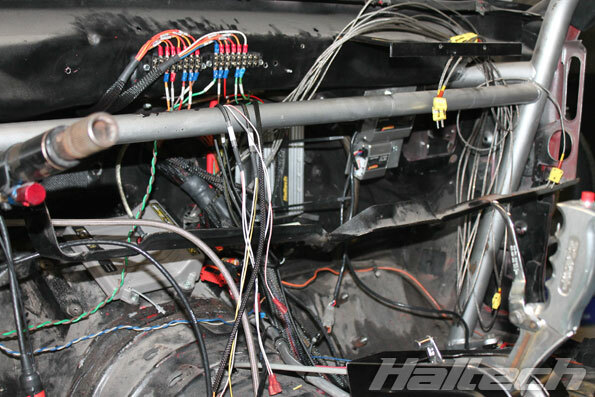 The “Haltech Overhaul Team” quickly appraised the car and got to work on the EFI conversion. 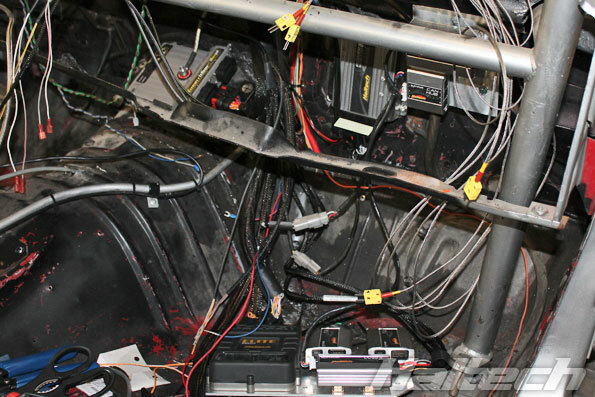 Over the years Derek’s car has accumulated a series of mods and temporary fixes so it was a good opportunity to do a complete re-wiring job to keep everything neat and tidy. 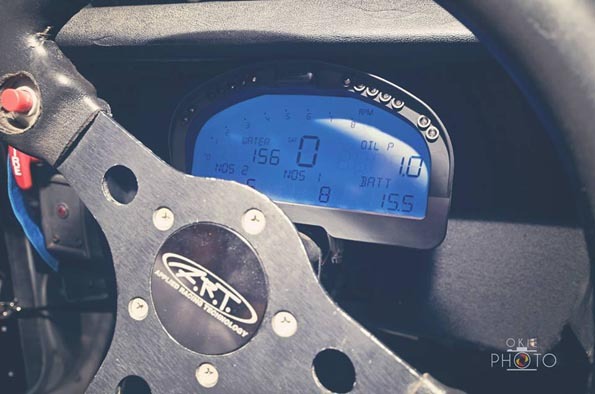 The weight difference between the old wiring, the carbs and all the gauges when compared to the new system was quite considerable. 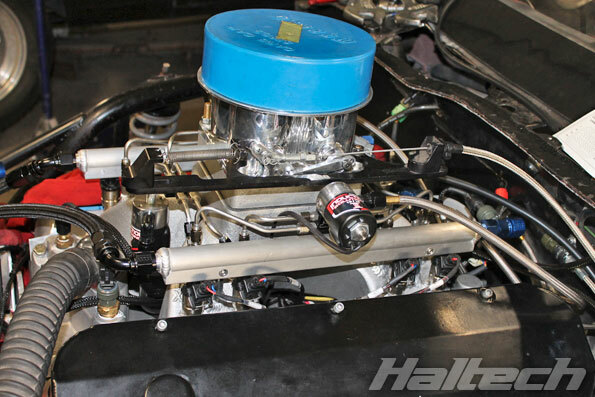 Elite now controls a two-stage Nitrous injection and makes any future upgrades quick and easy. Having lost a motor in the past due to low fuel pressure, Derek was particularly pleased with Elite’s Engine Protection Feature. 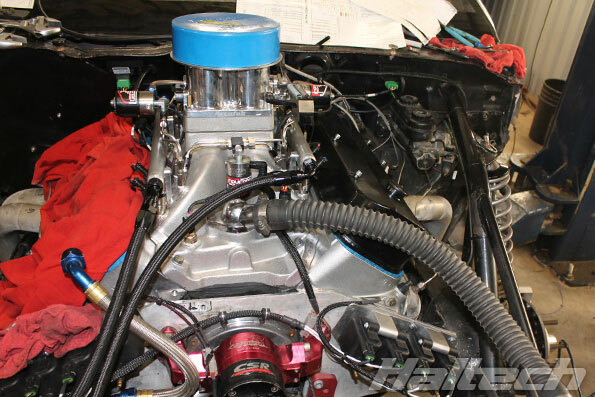 With the first couple of runs on Bo Woody’s dyno looking promising and Monte Smith’s masterful Nitrous tune we can’t wait for the next season of Street Outlaws to see how the Silver Unit will fare against the competition. 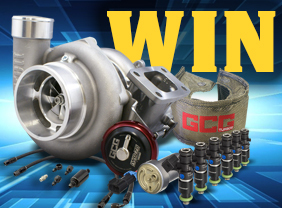 Big thanks to: RacePak, Fuel Injector Clinic, MagnaFuel for supporting the project with their awesome products. 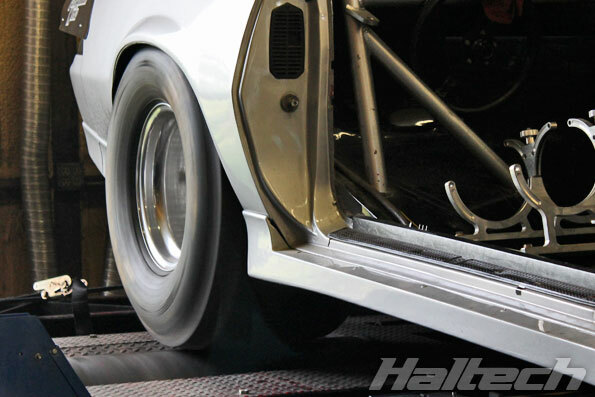 Bo Woody for letting us use his dyno facility, Monte Smith for his legendary Nitrous tune and OKIE Photo for the glamour shots of the Silver Unit. 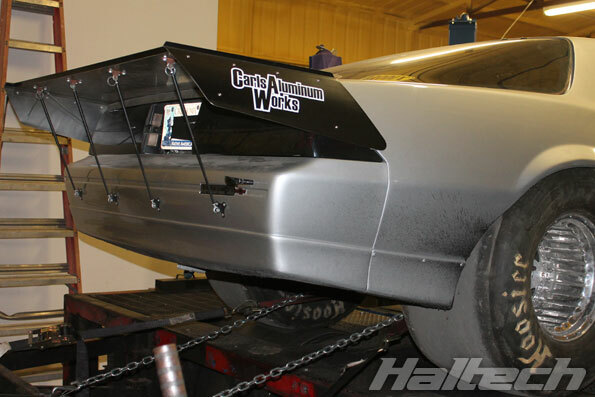 A couple of long nights and numerous pizzas later the car is finally ready for its first dyno run. 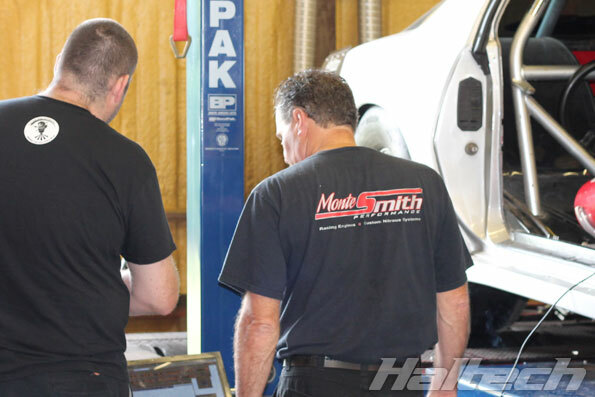 The Silver Unit EFI Conversion Team, from left to right: Ben Horwood, Monte Smith, Bo Woody, Jason Yarber and Dale Heiler. Monte Smith exchanges notes with Dale Heiler.